When faced with July's oppressive heat and humidity—the kind in which we can literally hear our hair frizz when we step outside—it's practically second nature to throw our hair up into a topknot and call it a day. It's quick, simple, and stylish in an effortless kind of way, but most importantly, it provides much-needed relief from sweaty hair syndrome. That being said, there is one caveat to the emblematic 'do of don't-care hair: If you've spent any time or money on styling beforehand, there's a pretty good chance you're going to undo it all once you tie that knot. 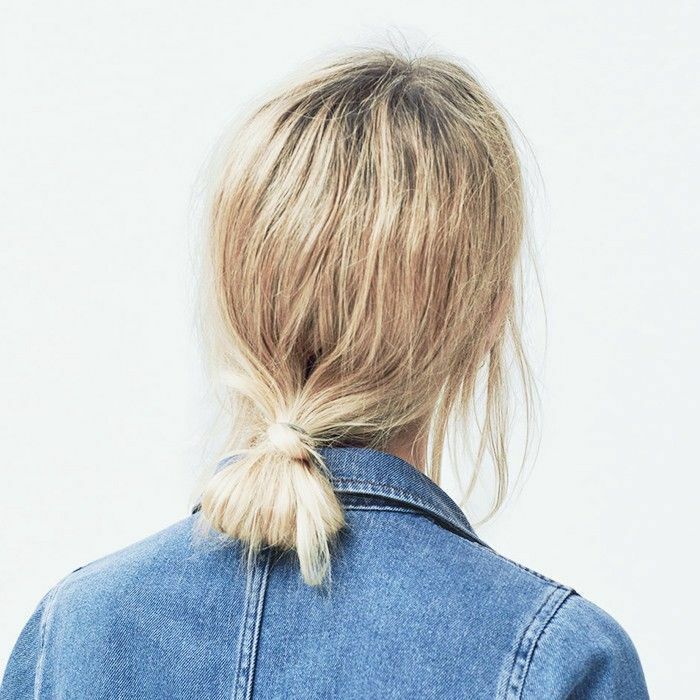 Which is why this summer, we've been turning to an equally foolproof but also blowout-friendly updo: the low knot. Because the low bun (or any of its varietals) is positioned at the nape of the neck, it doesn't disturb the hair at the crown of your head like the topknot does. Depending on how you twist your hair up, you might get a few rumpled waves, but they're the effortless, cool-girl kind instead of disheveled chaos—the Instagram version of bedhead rather than the real-life version, if you will. It's also easy to tweak the styling. My super-thick, wavy hair is currently cut into a long shag, and my low knot of choice is a messy loop bun, which works well with my short layers. Because I don't have enough length to really twist it into a bun, I pull it back into a low ponytail and fold the bottom half under, securing it with an elastic. It takes all of five seconds, it looks prettier throughout the day as piece-y strands fall to frame my face, and when I'm ready to wear it down again, it looks like I never had it up. But the possibilities are endless. Want a little more polish? Conceal the elastic by wrapping a lock of hair around it and finishing off with some shine spray. For a sleek day-to-night transition, slick your roots back with a pomade or gel—and embrace the on-trend wet look when you let your locks back down. Twist a ponytail into a tight chignon and coax out the waves with a texturizing mist after taking it out. Top off whatever style you choose with a bandana or gilded barrette. All this, without ever having to un-plaster strands of hair from your sticky forehead or bat a cloud of frizz out of your eyes. Want more summer hair inspo? See which hair colors are dominating the streets of NYC.